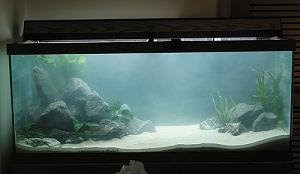 Cloudy Aquarium is usually what you see when the fish tank has just been newly setup (usually within the first two weeks) and the aquarium has yet to establish the beneficial bacteria that breaks down harmful chemical like nitrite. During this initial stage, it is imperative that you conduct regular water changes (once every 2 days if needed) and monitor on the ammonia, nitrate and nitrite levels at all time using water test kit. It is also a good idea to reduce the number of fish so that less waste is generated until the aquarium stabilizes. Once it is in the final stage of the cycling process, the water should start to clear up and clarity improved tremendously. Sometimes, certain types of fish food can also cause the cloudy aquarium water. Avoid fish food that dissolves easily in water and become mushy once it turns into leftover and not eaten by the fish. Usually these are the results of cheap fish food that is offered at low prices. These types of low nutrition low value food are usually made up of flours as the main ingredient. Beware and check carefully on the manufacturers because the negative effect that it brings in the long run outweighs on the money saved. Another reason that could cause cloudy aquarium is clogged up aquarium filter. Sometimes, accumulation of waste and debris will actually harbor unwanted growth and population of algae and bacteria. This type of condition not only affects the water clarify but prolonged situation is actually harmful to your fish since it might lead to introduction of aquarium fish disease. If this is detected, immediately wash and rinse the filter media ensuring that the condition goes back to normal. Cloudy aquarium could also be due to new decorative items that you add in. Make sure whatever that you plan to put in is properly washed and avoid putting items like driftwood that contains harmful chemical that could peel off and contaminate the water. Finally, if you don't mind spending money for your home aquarium, another option is to either get a UV Sterilizers or Protein Skimmer (only for saltwater aquariums) to overcome issues related to cloudy aquarium and achieve better water clarity.